Today, Designmaz will show you the most beautiful website templates for sport for any type of sports website such as soccer, diving, fitness, surfing, cricket, racing, body building, golf… Use this collection templates and customize it on your own. 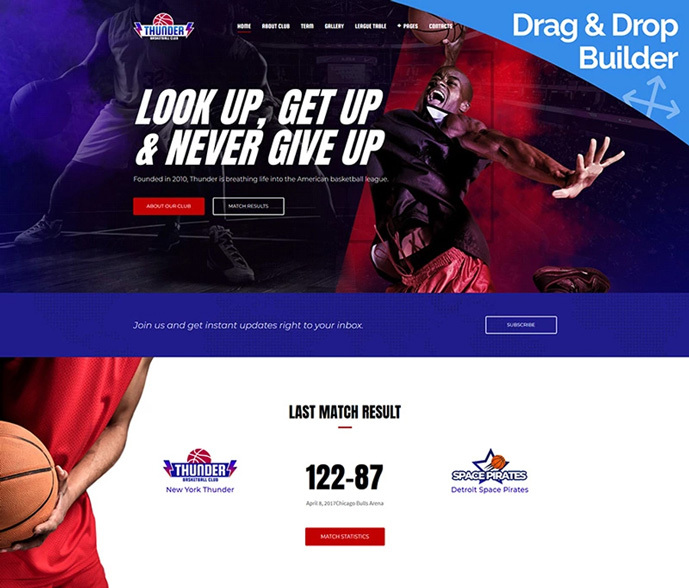 Thunder is a premium sports website template featuring a usable and fully editable layout. It is intended to be used for sports, travel, and active lifestyle sites. The theme will work well for both personal and business sites. It features a fully responsive layout. The design is cross-browser compatible. You may be sure that all pieces of data and design elements will be displayed in all web environments in the proper style. The theme is fully responsive. Built with the valid, semantic code, it is intended to run on all devices flawlessly. 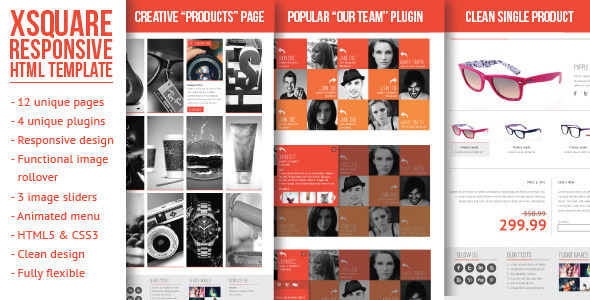 It is integrated with the intuitive drag-and-drop MotoCMS page builder. With its help, even a newbie will be able to create a versatile web page code-free. 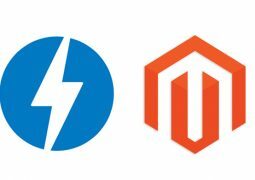 A rich selection of the customizable ready-made pages is included to save you extra time on the web development. 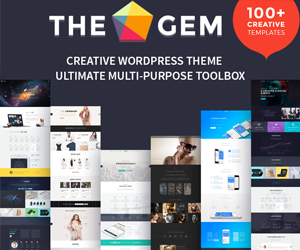 The theme supports all the major types of content. 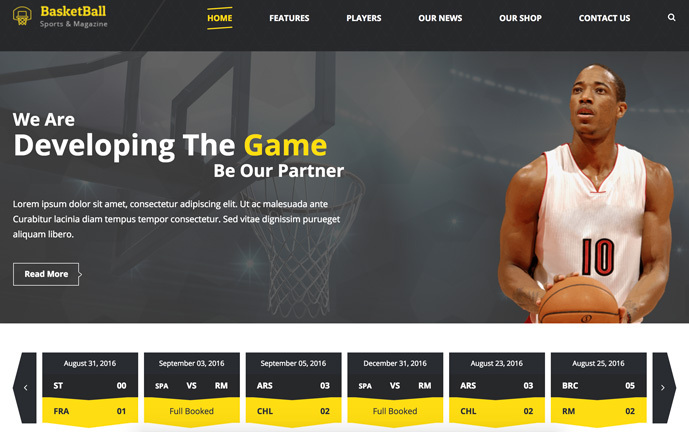 Thunder basketball club MotoCMS template is also integrated with the fully featured blog. With its help, you can keep your web audience always updated on the latest innovations and news in the industry. You can make the presentation of your data more remarkable with the help of video integration, audio player, SoundCloud, Media Library File Manager, and a whole lot of other useful tools. The theme is bundled with the detailed documentation and free 24/7 support. Even if you have little to no coding skills you will be able to build a web project on your own. In case of any issues, the qualified tech support team will come for help. Building your personal sports & gym website has never been easier and in case you experience any problems or need special design assistance our top rated support will be happy to help you. 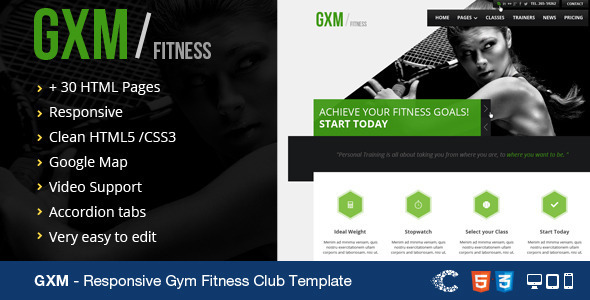 BeFit is an exclusive HTML5 template that offers amazing features for Gym & Fitness certers. This template is built for Sport Clubs, Health Clubs, Gyms, Fitness Centers, Personal Trainers and other sport and health related clubs. It has purpose oriented design and comes with events, classes, schedule, opening hours. It is very easy to customize with no programming skills as well as advanced developers. Soccer sports – soccer & sports HTML Template is for football club, soccer club, sports club website, sports news, sports blog. Soccer & sports HTML Template is for basketball, rugby, volleyball, handball, cricket & hockey. This soccer & sports HTML theme is also for sports news, football club, football news, sports event, sports news, event magazine template, sports multipurpose template, football league, sports blog, sports cup, league sport,game, golf, gym, sports events, sports magazines, sports organization, sports online shop store. Soccer & sports HTML has teams, players, Sports news and fixtures and other sports related features. 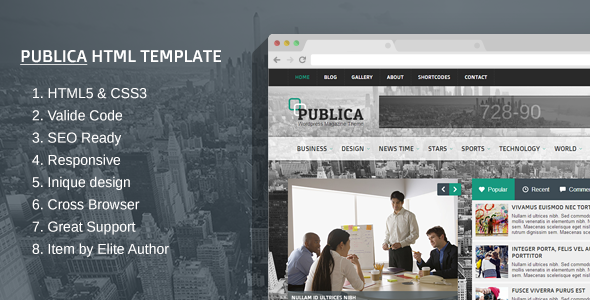 The template is carefully crafted with very useful homepages and inner pages powered with a lot of features. 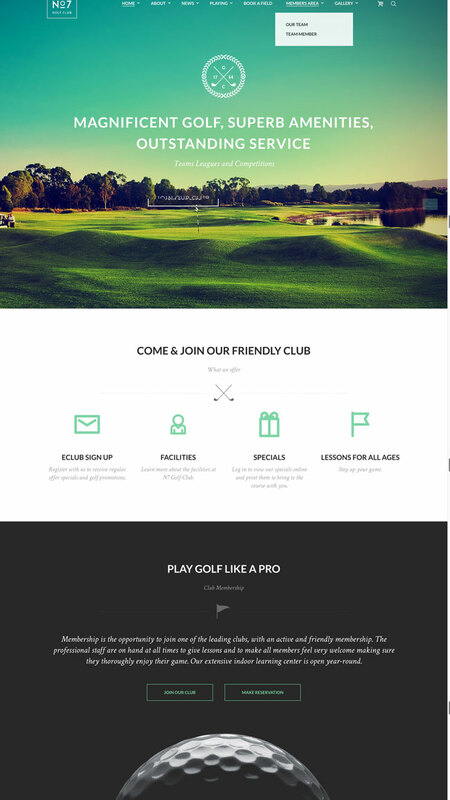 N7 is a modern and professional, HTML5 & CSS3, perfect option for tennis clubs (as well as other sports), personal trainer’s page, Golf Course website, Golf Club website, sports centers, tennis/ sports review magazine, and sports store. This template has an extremely multi-functional design and is highly versatile. It is fully responsive, Retina-ready and cross-browser compatible. N7 is supplied with extensive HTML Documentation that will teach you how to install and set it properly. 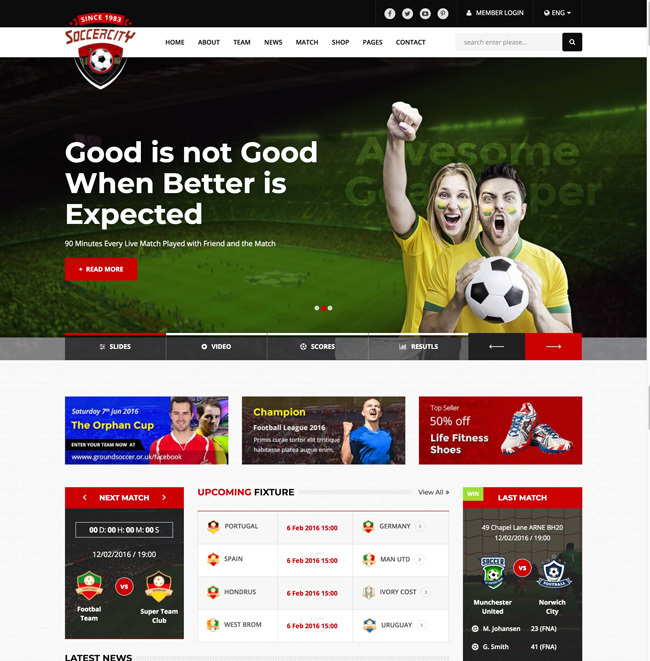 SportsMagazine is an HTML5 and CSS3, Bootstrap Framework template specifically designed for modern soccer clubs, leagues, and for team and players, fixture matches multiple views gives clubs, leagues the luxury to manage their events on their website. 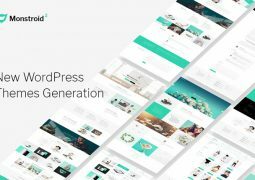 Customize your website as much as you want, you have tons of layout possibilities with unlimited variations and colors. Results, fixtures, blogs, teams, players, and detail view included in this theme. 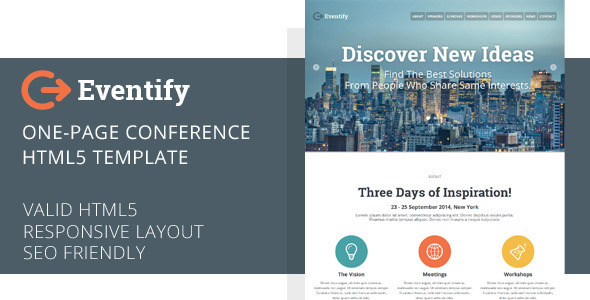 Eventify responsive html5 one page conference template is an eye-catching event template for conferences, boot camps, festivals or sporting events. This template helps you to build a consistent brand, communicate the what, where and when clearly, and provide useful information on your event. The layout is responsive which scales down to downsized browser windows, tablets and mobile phones. 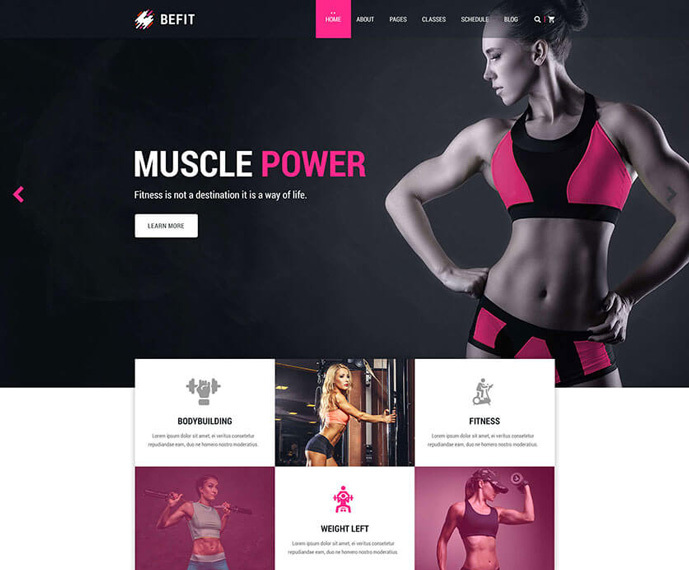 Fitness life is a responsive and stylish HTML Template that is perfectly designed for health, fitness, spa, gyms, and it would work perfectly for many sport business types. 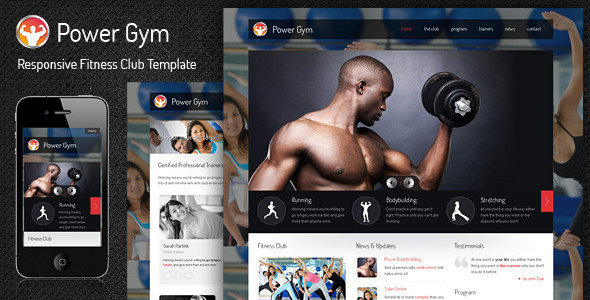 Power Gym template is dedicated to create a gym, fitness, sport related website. The template includes several gym dedicated pages like program, trainers and sport categories. The layout is responsive, looking great from a desktop view down to a smaller mobile resolution. 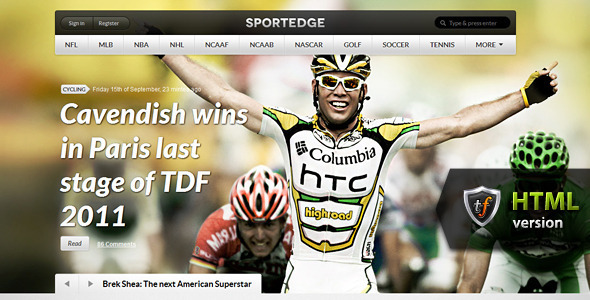 SportEdge Magazine is the best Sport HTML theme we could have come up with, that’s a given! 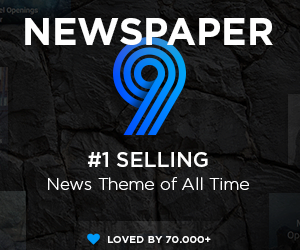 As you can see for yourself, it has a powerful adrenaline vibe to it, with a very dynamic homepage slider and bold typography, giving this sport HTML theme a sharp & modern feel. We wanted to create a Sport HTML theme for so long, a template that would cater to all the football, soccer, baseball or basketball fans out there. And we honestly think we’ve made something great with SportEdge Magazine. Enjoy! 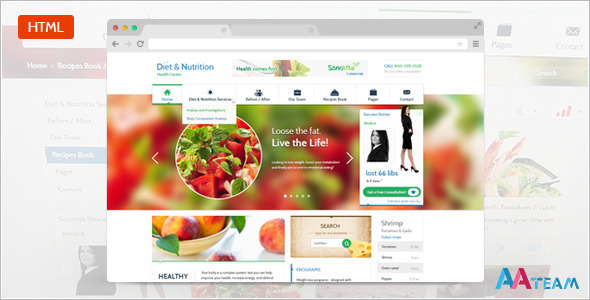 Diet & Nutrition Health Center is a clean, modern Responsive HTML5 Template suitable for any businesses that are in the following / related domains: Diet, Nutrition, Dietitian, Health , Wellness, Sport & Fitness, Weight Loss and Weight Loss Programs and for Clinics/Centers that offer these kind of Services. The Template is 100% Responsive & Retina Display Ready and is guaranteed to have a great appearance on all devices, on large desktop screens and on tablets and mobiles as well. 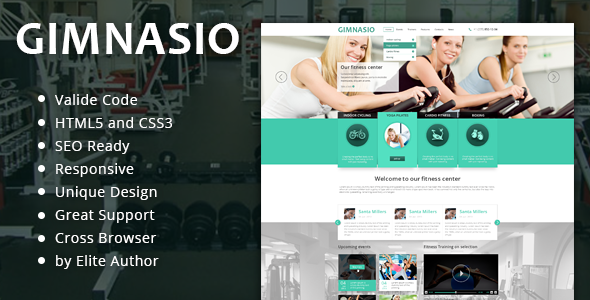 Gimnasio Responsive HTML Template – is the best way to build a site designed mainly for fitness and gym website. It can also be used for any other type of website, especially for sports, spa, events etc. 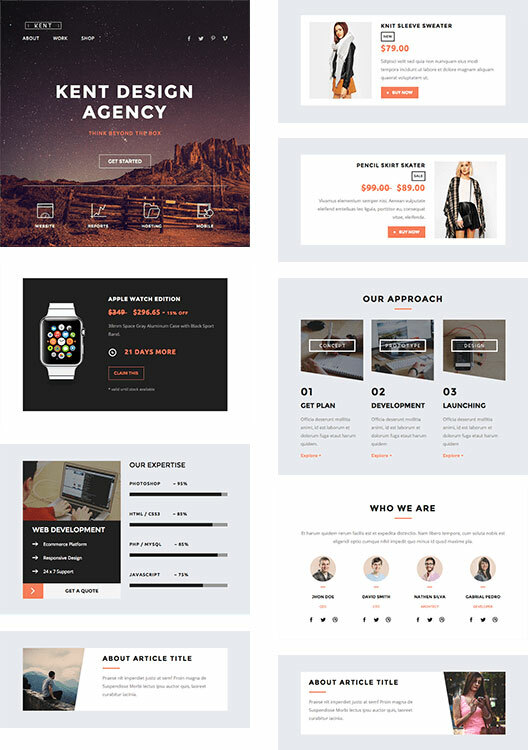 xSquare responsive & clean template is a multipurpose template with a lot of interesting page solutions and designs. It is fairly easy to modify and to implement your own content. With intelligent responsive grid you will have no problems displaying your template on any device with all screen resolutions. xSquare responsive template is an all-around template and it can perfectly suit your needs regardless of your website business. With few modifications it can easily be a medical website, sport website, business website, or any other commercial or professional website that you might need. 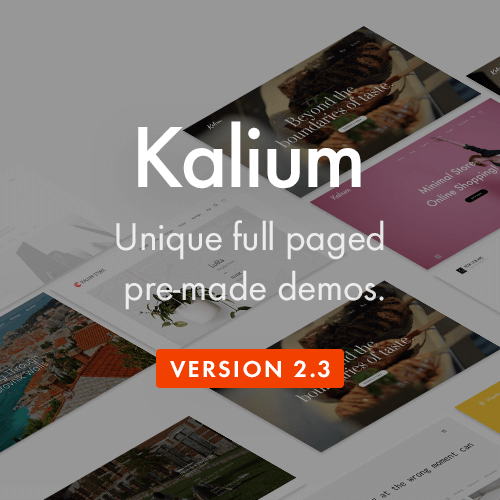 Callisto is a sharp looking HTML template, that offers two different style options – light and dark. Callisto is fully Responsive, it looks and works great on mobile devices, tablets and computers. 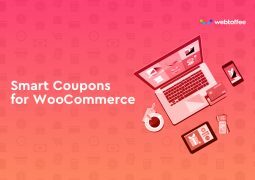 It has 16 different templates including cart, checkout, customer management section, blog and etc. 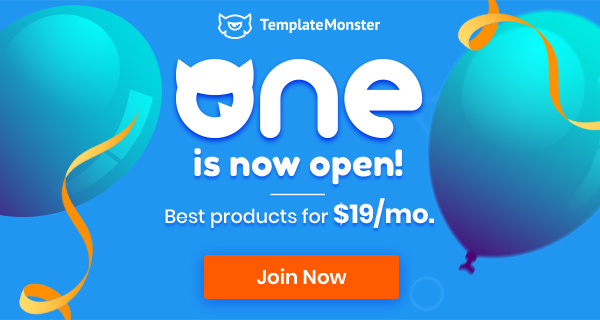 Template is highly customizable, sports unique “quick shop” feature and other great features. It is great for selling products of any kind – everything from fashion clothing all the way to computer hardware will look awesome and sell well. 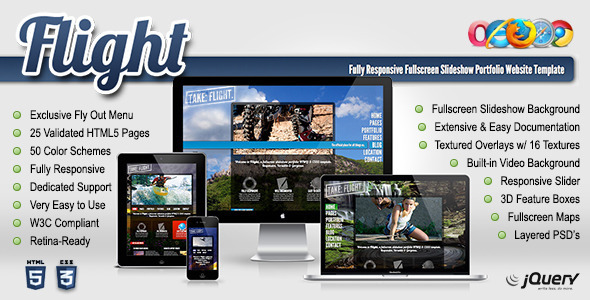 Flight is a stunning, interactive, fully responsive, Retina-ready, fullscreen background slideshow template. It has a modern transparent look and includes a completely unique fly out menu that responds on command. The menu optimizes and adjusts both horizontally and vertically – all based on the end-user’s device resolution. 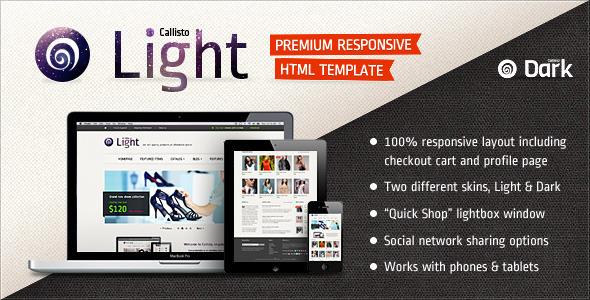 Flight is designed with the latest technologies in W3C validated HTML5 , CSS3, and jQuery. It is well-suited for a wide variety of purposes, including (but not limited to) photography or professional photo gallery, full screen gallery, blog, portfolio, artistic showcase, beauty or fashion, personal, non-profit, sports, marketing, or any other person, artist, or business that has creative visual work / artwork that deserves to be set apart from the rest.